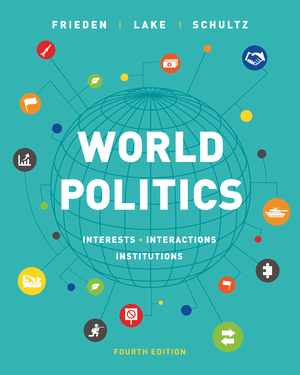 With a framework based on interests, interactions, and institutions, World Politics gives students the tools to understand international relations. In the thoroughly updated Fourth Edition, new Controversy units provide models for applying the concepts in each chapter to real-world issues and events. New InQuizitive activities—created and tested by instructors who teach with World Politics—then invite students to practice applying the analytical tools from the text to alternative examples and cases. Developed and tested by a team of World Politics adopters led by Dustin Tingley (Harvard), with the guidance of the textbook authors, these assignable activities help students get the most out of their reading. InQuizitive’s adaptive approach ensures that each student receives a mix of questions keyed to his or her grasp of the material. As students progress through the InQuizitive activities, they answer questions about fundamental concepts as well as questions that involve the applying the concepts to examples and cases. Detailed feedback at each step helps students stay on track. In the Fourth Edition, the popular “Controversy” sections in each chapter have been rewritten. They now provide fresh cases and a clearer model for applying concepts to current debates in international politics. “What Shaped Our World” units use the book’s analytical framework to illuminate key historical developments. Written by three leading scholars, World Politicsincorporates current research more fully than any other text of its kind. It reflects the way international relations researchers see the field today. The authors’ flexible analytical framework based on interests, interactions, and institutions provides the toolkit students need to understand the topic of each chapter. Chapter-opening puzzles that address challenges in world politics sparkstudent interest and provide a hook for the analysis that follows. For example, Why do countries go to war when negotiation is a less costly way to resolve disputes? Why is it so hard for countries to cooperate to protect the environment? Why does every country restrict trade in some way despite broad consensus that trade is economically beneficial? This problem-oriented approach emphasizes the compelling questions that draw scholars and students alike to the study of international relations. 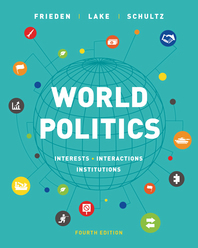 A flexible framework structured around interests, interactions, and institutions helps students understand the chapter-opening puzzles and the major topics in international relations. After this framework is introduced in Chapter 2, the authors apply it to every major topic that follows. Within each chapter opener, a “Thinking Analytically” section previews how the framework will be used in the subsequent pages. Next, Controversy and What Shaped Our World boxes explicitly apply the concepts from the framework. Finally, at the end of each chapter, a Study Tool Kit section reviews how the framework was used in the chapter. “How Do We Know?” boxes in each chapter present the empirical evidence behind important findings, drawing on recent research. For example, the NEW “How Do We Know?” box in Chapter 4 describes a study that answers the question: Are women leaders more peaceful than men? In Chapter 14, a NEW box explains recent research on border walls and economic inequality between neighboring states. Thoroughly updated, the Fourth Edition provides insight into recent developments like the rise of nationalism in Europe and the United States, China’s growing influence, new tensions over North Korea’s nuclear weapons, and the Paris Agreement on climate change. Chapter 3: Why Are There Wars?